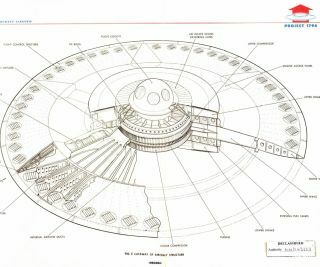 Newly declassified designs show the Air Force's attempts to build a flying saucer capable of both hovering and going supersonic. Declassified files about a U.S. Air Force flying saucer sound like a conspiracy theorist's dream come true. But the designs simply reveal more about a known military project from the 1950s that ended up more in the realm of science fiction rather than science fact. Drawings of the saucerlike vehicle come from "Project 1794, Final Development Summary Report" — a 1956 document recently uncovered by the National Archives that describes a vertical takeoff and landing (VTOL) aircraft capable of hovering at ground level and reaching supersonic speeds in the sky. But tests at the Wright-Patterson Air Force Base in Ohio soon showed that the concept fell far short of its supposed promise. The U.S. military had hoped the aircraft could reach a top speed of Mach 4 (2,880 mph) and climb to a height of 100,000 feet (19 miles) — a performance that would have handily beat the Air Force's SR-71 Blackbird spy aircraft that took to the skies during the Cold War. It contracted a Canadian company, called Avro Aircraft, to build two small models of the "Avrocar" aircraft for testing. Avro Canada VZ-9AV Avrocar at the National Museum of the United States Air Force. But the Avrocar's attempts to float above the ground on an air cushion created by its turbojet engines proved too unstable even a few feet off the ground, according to the National Museum of the U.S. Air Force. The Avrocar suffered from uncontrollable rolling motions during flight tests above three feet (called "hubcapping" by Avro engineers), and never got beyond speeds of 35 mph. Wind tunnel tests at the NASA Ames Research Center at Moffett Field, Calif., also suggested the flying saucer design was aerodynamically unstable and would prove uncontrollable at high speeds, let alone supersonic speeds. The U.S. military ended up canceling the project in December 1961. The Cold War concept may have proved too good to be true, but it also held some lessons for future VTOL aircraft. And modern aerospace engineers have already made much progress in creating more stable hover technologies for either manned vehicles or drones. A supersonic flying saucer also remains an unlikely concept even in the year 2012. But that does not rule out wonderfully futuristic designs for new aircraft — NASA awarded $100,000 to study a four-pointed supersonic flying wing that resembles a ninja star. This story was provided by TechNewsDaily, a sister site to SPACE.com. Follow TechNewsDaily on Twitter @TechNewsDaily, or on Facebook.